The fortieth-anniversary edition of a classic and prescient work on death and dying. Much of today's literature on end-of-life issues overlooks the importance of 1970s social movements in shaping our understanding of death, dying, and the dead body. 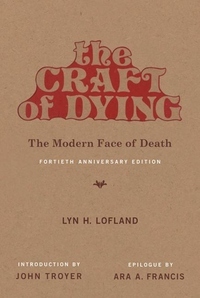 This anniversary edition of Lyn Lofland's The Craft of Dying begins to repair this omission. Lofland identifies, critiques, and theorizes 1970s death movements, including the Death Acceptance Movement, the Death with Dignity Movement, and the Natural Death movement. All these groups attempted to transform death into a "positive experience," anticipating much of today's death and dying activism. Lofland turns a sociologist's eye on the era's increased interest in death, considering, among other things, the components of the modern "face of death" and the "craft of dying," the construction of a dying role or identity by those who are dying, and the constraints on their freedom to do this. Lofland wrote just before the AIDS epidemic transformed the landscape of death and dying in the West; many of the trends she identified became the building blocks of AIDS activism in the 1980s and 1990s. The Craft of Dying will help readers understand contemporary death social movements' historical relationships to questions of race, class, gender, and sexuality and is a book that everyone interested in end-of-life politics should read.